This picture is from Wil Mandac of Sunnyvale, Calif. This picture was taken before the Division I Finals of the 2006 DCI World Championships in Madison, Wis. As I was fortunate to be with friends that were able to park in the structure next to Camp Randall Stadium, I couldn't help but notice what the corps members warmed up to before hitting the turf in front of thousands of fans. 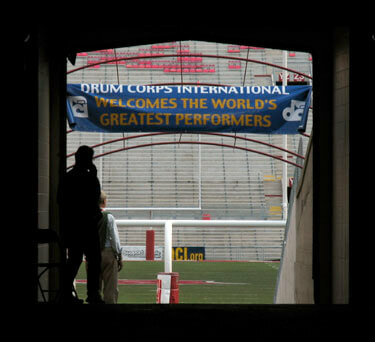 It's a nice touch, DCI, and I think many of us would agree with the statement on that banner.